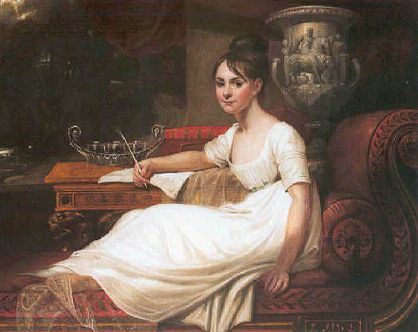 Eleanor Anne Porden (1795 – 1825) met her future husband on board his ship, the HMS Trent, and wrote a poem about his travels to the Arctic. Captain John Franklin took her admiration to mean he could have her for the taking. Eleanor was one of England’s Romantic poets. Her “Veils or, Triumph of Constancy,” written when she was a teenager, had been published by John Murray II, Byron’s publisher, in a “vanity” arrangement brought about by her father. It was said Miss Porden was not an accredited beauty like Lady Barry, but in this portrait she displays a lively intelligence that is most attractive, I vow. Veils did not sell well at first. Perhaps the dissatisfaction came from Porden’s attempt to express her admiration for science in romantic terms. Rich in allegory, at some future date this blog will address Porden’s singular work, but for now, it must be known that her father had to forward eighty-four pounds and four shillings to the publisher to cover initial losses. John Murray Publishing is still in operation today, presumably no longer offering vanity arrangements. He dashed off a letter in response, appalled that his proposal had upset her “exquisitely.” He would have her know he was not the cold and formal stranger she thought him to be. His proposal was clumsy only because it was likely to be met with rejection. After all, there were ten other aspirants for her hand, many of whom danced attendance upon her constantly at the modish salon she presided over, which discussed scientific and literary topics. She accepted the Captain’s explanation and now admitted he had thrown her into “pretty confusion,” agreeing to marry him. However, throughout their long engagement, the couple exchanged such heated correspondence (and not a word about love) that it seemed their marriage might not take place. He conceded that point but demanded she give up her Salon, which met on Sundays. The Sabbath is a day which must be devoted to reading books on moral instruction. Still clumsy, her fiancé then proffered for Eleanor’s education some correspondence he enjoyed with his good friend Lady Lucy Barry. Her ladyship had generously provided religious books which had been of great comfort to him and his men on their Arctic journey. 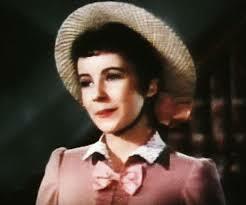 She added that Her Ladyship must be a Methodist and had perhaps converted the good captain. Shortly thereafter, Captain Franklin became Lord Franklin. Nevertheless, his elevation to the peerage left Eleanor unmoved and unwilling to set a date for the marriage. This was in July of 1823, four years after the engaged couple had met, seven months after their betrothal. Then Lord Franklin left off his correspondence and demonstrated his intent by deed. He sent Lady Barry packing. The battle was at an end and the couple wed in August. They had a daughter, but the birth plunged Eleanor into another battle–one she could not win. Now it was time for her to demonstrate her love. Lord Franklin was to embark on another long voyage of exploration. Eleanor readily urged him to pursue his vocation. She told him not to linger and wait for the tuberculosis she suffered from to run its course. She loved him enough to let him go, even though she knew she would never see him again. This entry was posted in Regency, Uncategorized and tagged Arctic exploration, Eleanor Porden, HMS Trent, John Franklin, Lady Lucy Barry, The Veils by Angelyn. Bookmark the permalink. So, did he go? If he did, I find that to be a sad ending. Great post though! Tweeted and shared. He did go and when he returned, he married Porden’s friend who later became known as the Penelope of England, for having despaired of Franklin’s return on a subsequent voyage. It appears he and his crew had encountered some mishap and there was evidence of cannibalism, which none of them survived. How fun to see a lady who stood up for herself and still got her man. Yes–she knew precisely who she wanted and she got him on her own terms.